Kinect was the coolest gadget Microsoft made that no one actually used, but now the company is bringing it back with an all new focus: AI and the cloud. At its Build conference today, Microsoft announced Project Kinect for Azure. Azure, if you’re not familiar, is Microsoft’s cloud computing service, and the star of Microsoft’s show this year. 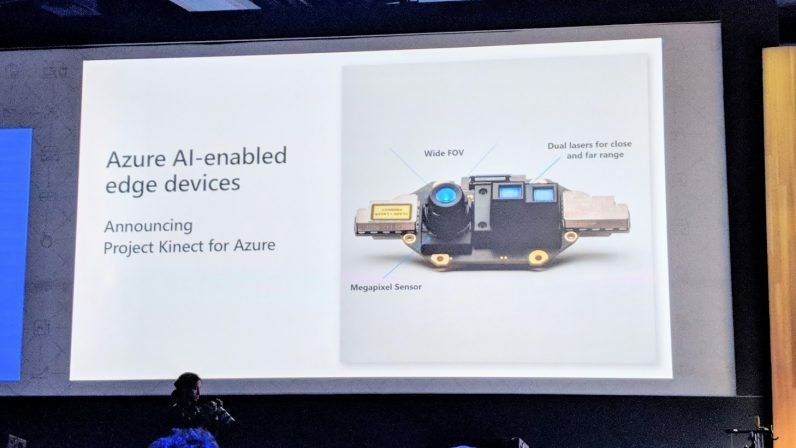 Project Kinect basically takes the depth-sensing prowess of the Xbox accessory, shrinks it to a tiny frame with new sensors for developers to use with AI and Internet-of-Things via Azure. Microsoft says it’s used some of the advances made through HoloLens – which in turn, was informed by the original Kinect – to enhance Project Kinect’s spatial understanding, object recognition, skeletal tracking, and more. The company breezed through the announcement, but an image of the device showed a ‘megapixel sensor’ with a wide field of view, onboard computing, and dual lasers for depth sensing at both near and close ranges. Let me be clear: Project Kinect isn’t a gadget to connect to your Xbox and dance in front of. It’s more a spiritual successor, building on Kinect’s unexpected heritage as a nifty tool for developers, researchers, and students. The Kinect was ahead of its time, but it’s cool to see the technology behind it is still making its mark. The company hasn’t said when developers will be able to get their hands on Project Kinect to integrate it to their own devices and services, but we’ll let you know when we find out more.